Chair’s report March 2018 – Glen Eden Apartments, plastic free initiatives and Holi! 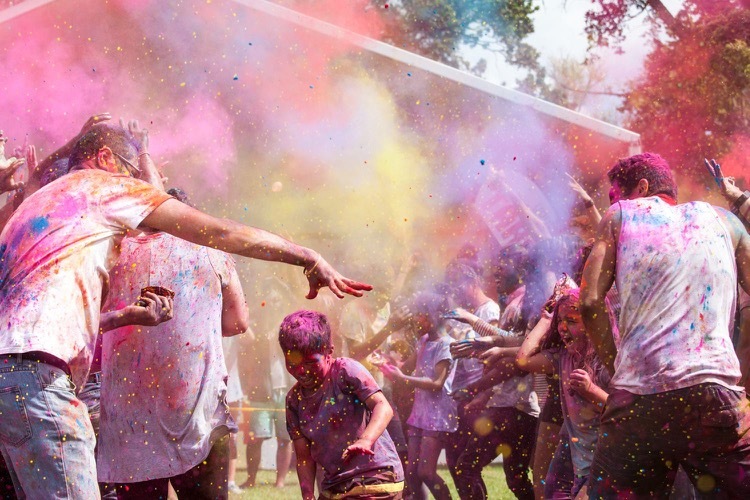 Home / Community / Chair’s report March 2018 – Glen Eden Apartments, plastic free initiatives and Holi! The new year has been off to a frenetic part and there is a lot to report on. The ten storey Glen Eden apartments are now being constructed. Within a year or so the area will have 160 new residences, many of them social housing. The man behind the project is Ted Manson and refreshingly he is doing this for philantrophic reasons. He has an interesting background. He grew up in poverty and spent a great deal of his early years living in a state house. He then became exceptionally successful in business. I woke up one day and I got a social conscience. That happens at some stage of your life for some, but not for all. Up until then, I was a capitalist. The opening of the apartments and the welcoming and integration of the new residents into the community will be an important job and I believe the local board has a role to play in assisting with this. I have suggested that we meet with members of Manson’s foundation so we can discuss how to make this happen. Housing call to action is a local group dedicated to improving the plight of the homeless. The local board gives them some support and it was our pleasure to provide them with the use of the Ceramco Park Function Centre for a recent community hui. It was well attended with over a hundred people present. It was very informative with presentations from MSD and Housing Corporation and the highlight being a speech by Minister of Housing Phil Twyford. Clearly addressing the housing crisis is a priority for the new Government. And the solution is conceptually a very simple one, more houses have to be built. As well as outlining Government policies to improve supply Twyford also talked about a change of tone and approach. Instead of Housing Corp being essentially a property management company he is proposing a more holistic approach so that tenants needs are met. And he also wishes to improve security of tenure so that the relentless churn of homes that some endure will lessen. The Hui showed the importance of Government action. But it also highlighted the importance of community and how the two sectors working together can address this most difficult of issues that Auckland faces. Over the past few months Watercare’s team of ecologists with some independent contribution have been performing an ecological survey of the area. The report has been completed and Watercare has publicly consulted on the results. I thought that the consultation was too early as the construction plans have not yet been finalised and views should not be sought until all the information was out there and people can appreciate the enormity of the plant and the scale of clearance that would be required. Some of the questions asked at the consultation were helpful. For instance “What opportunities do you see for reusing [the existing] facility, recognising some of the newer extensions (non-heritage aspects) of the plant may be demolished?” My personal response to this question would be “as much as possible. The currently cleared site should be recycled as much as possible, and this includes the settlement ponds, the chemical storage area and the office space. Another question that was asked was about the future of the Nihotupu Filter Station which is a heritage building. This poses an interesting question, if there really is no alternative, what should be sacrificed? High quality vegetation or the filter station? And the recent disruption caused to the area by the resealing of Scenic Drive has already shown the susceptivity of the area to chaos caused by public works. The thought of the effect of the construction of a large plant over a couple of years on the area does not bear thinking about. Watercare map showing categorisation of area’s ecology. My personal view is that more a more detailed construction proposal needs to be consulted on. And the consultation needs to be sufficiently sophisticated so that all options and alternatives are considered. Consultation on Auckland Council’s budget for the next ten years is now open and by the time this report will be considered will be nearly over. I would urge everyone to submit on this. Council is proposing that for the next year there will be a general rates increase of 2.5%. Individual increases will vary according to the value of your property. If your house value has gone up slower than the regional average then you may get a decrease. I checked online what my rates will be and it suggested that for my Titirangi home I will enjoy a decrease. It is also proposed that the transport levy be discontinued and replaced with a regional fuel tax. I never supported the transport levy. It meant that a Piha resident who has no access to public transport would pay in effect more than Sky City whose generation of vehicle trips in Auckland is substantial. I am a cautious supporter of the regional fuel tax although I would like to understand more fully what effect it will have on locals. Overall it is anticipated that the fuel tax will cost an average household $140 each year. The cost will be 10c per litre. The extra money will be used for much needed transport projects. Other proposals are important for the west. The targeted water quality rate proposal of $66 for the average household per year would allow for the accelerated roll out of projects needed to improve Auckland’s water quality. Poor water quality is an important issue for our area. We have ten of the most polluted swimming areas in the region. In my view all our beaches and lagoons should be swimmable. The proposed rate will fund projects to reduce wastewater overflows into the Waitemata Harbour and reduce stormwater volumes entering the Manukau Harbour. There will also be work on reducing litter and pollutant flows into the stormwater system throughout the region and a system for proactive monitoring of onsite waste water treatment systems such as septic tanks will be established. The other important initiative is the targeted environmental rate. Three options are offered for discussion. The lowest is essentially the status quo and will mean that $109 million will be spent over the next ten years on environmental matters. The risk of Kauri dieback spreading is said to be 80% and generally significant environmental degradation will occur. The highest option will cost the average household $47 each year and will result in a total of $420 million being spent on environmental initiatives. About a quarter of the total collected will be spent on dealing with Kauri dieback. The risk of spread is then estimated to be 25%. And more significant action regarding weeds and pests will be able to be taken. Some westies are proposing that the increase should be even higher and set at a level that would allow for the Regional Pest Management Strategy to be implemented in full. The extra cost would be $12 per average household per annum. Both the targeted water quality rate and the targeted environmental rate are important for out West and I urge people to consider supporting them including the suggested enhanced environmental rate. They will address two major environmental problems that we have, poor water quality in our beaches and lagoons and the devastation of our forest by the spread of Kauri dieback. Locally the board has prioritised improvements to Glen Eden as its priority. We also will continue to advocate for increased budgets for the Waitakere Ranges heritage area and work on completing and implementing our Greenways plan. We are hopeful that current Council deliberations will result in the necessary funding for these important projects to go ahead. Since the writing of my last report Auckland Council’s Environment and Community Committee have again considered the issue of what to do about Kauri dieback. The local board presented to this meeting. After considering the further agenda item we reviewed our position which we reached in December 2017. Rather than close only medium and high risk tracks we decided that the park needs to be closed and only specific areas left open. We suggested that open areas could include coastal walks without Kauri and Watercare service roads. We thought that there needs to be a process to determine which other tracks can be opened and when. Te Kawarau A Maki and the community should be involved in this. And proper enforcement of the closure is critical. Our position was that Council needed to take a pause, review the current situation, create a long term coherent plan and determine what will provide public access and what will protect Kauri. Council is currently consulting on the resolutions passed which essentially matched our view of what should happen. A further report is to be presented to the committee in April. As part of regular maintenance work Scenic Drive between Titirangi and Woodlands Park is being resealed. The work is being performed at night to minimise traffic disruption. I am aware that this is causing many local people sleep disruption. The contractor and Auckland Transport are willing to work with locals to do what they can. If anyone is experiencing problems drop me a line and I will make sure Auckland Transport follows this up. The infamous Mels Barton has again run a successful Seaweek series of events. This included the annual clean up of Cornwallis beach and the sea castle competition. Along with Deborah Russell and Steve Tollestrup I was privileged to be a judge of the competition. The competition gave an emphasis on sustainability and there were some very good entries. Competition was fierce with five entries being within a couple of points of each other. It was good to see so many young people being involved and presenting on the dangers of plastic to our environment. Love Titirangi who brought to the west the plastic bag free campaign that launched last year held a recent event to highlight the issues posed by plastic. The Local Board provided them with support and it was good to see the support used so well. The event involved young students at Laingholm Kindergarten creating posters showing why we all have to do something about our plastic use. The involvement of young people in our community gave the event so much power. These people have the most to lose if we continue to trash our environment and we owe it to them to start preserving what we have. The damage that plastics are causing to our environment, particularly to our oceans, mean that we have to dramatically change our behaviour, now. The event was attended by local MP Deborah Russell and myself as well as media. Deborah had the job of reading a chosen story to the young citizens. I can confidently say that this would have been much more satisfying than her average Parliamentary session! One of the nicest things about living out west is the diversity of our communities. Part of the standard speech I give to citizenship ceremonies advises new citizens that we do not expect them to forgo their culture and they should continue to be proud about their cultural heritage. I am really pleased that people do and that we live in a community where everyone relishes the cultural diversity that we have. Holi festival is an event where Indian culture is celebrated. And celebrated in style. It is to commemorate the start of the Northern Hemisphere spring and the hope of a bountiful harvest. It is also a time where people throw coloured powder at complete strangers and squirt water at each other. I have been to three festivals. I have never seen so many completely happy yet completely sober westies in all my time here. I recommend that everyone goes to the next one. Congratulations to the Waitakere Indian Association for a fabulous festival and I look forward to the next one.